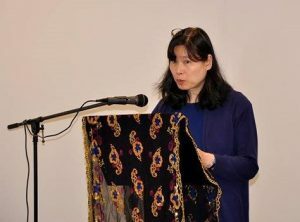 World Poetry Celebrates Elaine Woo! Ariadne’s notes: An enchanting afternoon with a dragon, Zeus and the Monkey King invited and presented by the talented poet Elaine Woo. 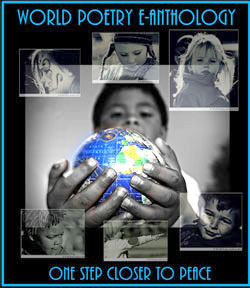 The World Poetry Team of Ariadne Sawyer, host and producer, co-host Neall Ryon, super engineer Victor Schwartzman and special volunteer Sharon Rowe welcomed her on the World Poetry Café Radio Show, 100.5 FM from 1-2 pm PST. Featured with a moving e-poem about a young boy from Aleppo was Robert W. McGregor and two poems from Kevin Morris from England. A tribute to Nadine Sims by Sharon Rowe was also included and will be read at Nadine’s Celebration of Life. Photo with scarf presented by a poet on tour from India. Each sequin represents a World Poet, she says. “Precariously oof loping oof, an oyster oof coating intruding nuggets of conscience, oof the Monkey King scuffed, rippled, scraped, scratched his rough chest and crown; under arched eyebrows of dust, oof to bring order his kingdom in a cave. Why vacillate so much between resentment and hatred? Sure, Sister-Monkey hid his stash of armor for 20 years with one of the Sea Kings. Oof-oof-oof. Okay, so she selfishly and arrogantly prevented him from invading a neighbouring mountain. He deserved pearls of respect not this goading reminder. He should demote her to cave janitor. Through Monkey ’s slow combustion, the haze of memory emerged: an intruder threatened their kingdom, Mountain Garden of the Waterfall Cave. His habit of feeding the shark of disdain with bloody morsels, meant he didn’t bother his sister with news of the incoming invasion. She suffered owwwf gross injuries. Beneath his fingernails, blood burst forth where he dug the hardest owwwwwh…. Upsetting his teacup, he stretched his occasionally 6-foot forearm to pluck his mobile phone from its reclining spot by the chopping board. Dialing, he realized he needed her was sucked by an undertow of gratitude. Elaine Woo (C) All rights reserved. This entry was posted in Ariadne's Notes, E-Poets, General and tagged Elaine Woo, International Peace Award Ariadne Sawyer, Kevin Morris, Neall Ryon, Nightwood Editions, Robert W. McGregor, Victor Schwartzman on March 12, 2017 by Ariadne.